There was an American sports comedy movie made a few years ago, about a group of misfits entering a Las Vegas Dodgeball tournament. From this movie, a new craze started first in schools and then to the general community. Now you can try this new social sport that's got something just a little different to it. Revolution Sports in Shenton Park have recently kicked off a weekly Thursday night tournament that has fast become one of their most popular social sports on offer. 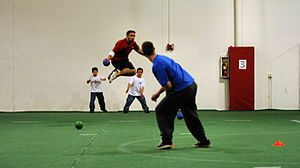 Dodgeball is a game where players on teams try to throw large balls at each other while avoiding being hit themselves. The skills are easy to pick up and the balls are spongy. There is no fixed dodgeball court design as it can be played on any basketball or volleyball court. There are now dodgeball associations in several countries. There is an Australian national Dodgeball team called The Emus. This game has a unregimented nature with no special requirement on the type of people who can play on your team. Everyone competes on an equal footing, meaning that all you need is any five of your friends, any team name, and you're ready to start. If you're interested in seeing how it all works, your first game is free. No registration fees and no commitment to play on, just a free taster to see if it is the weekly social sport for you and your friends. For further info contact Ben at the centre on 9388-3430 or email- info@revolutionsports.com.au. Further info here or visit 37 Lemnos Street, Shenton Park. More info on Australian dodgeball.